Jack of All Traaades! | Music | Style Weekly - Richmond, VA local news, arts, and events. Richmond-born tenor William Ferguson sings it all. The operatic tenor is usually seen and heard through a Mediterranean lens: a Luciano Pavarotti or Roberto Alagna, reaching for the high notes and reveling in the high passions of Verdi and Puccini, and behaving as if real life were an extension of the oversized, overwrought drama of the opera house. William Ferguson doesn&apos;t fit that picture. 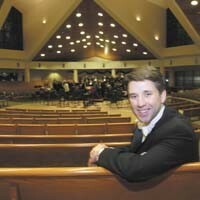 The Richmond-born tenor, returning home this weekend to join the Richmond Symphony in Bach&apos;s “St. Matthew Passion,” is a more life-sized figure. A trim 31-year-old who blends in with the Sunday brunch clientele at a Carytown eatery — he may have gone to school with some of them at St. Christopher&apos;s in the 1990s — Ferguson saves his showmanship for the stage. And he&apos;s singing on many stages. Last summer he divided his time between performances of JanA­cek and Schubert at the Marlboro Music Festival and singing in the road show of Eric Idle&apos;s gospel mash-up, “Not the Messiah” — “going literally from the sublime to the ridiculous,” as he puts it. William Ferguson joins four other soloists, the Richmond Symphony, Symphony Chorus and Greater Richmond Children&apos;s Choir, conducted by Mark Russell Smith, in Bach&apos;s “St. Matthew Passion,” April 17 at Second Baptist Church; April 18 at First Baptist Church; and April 20 at St. Michael Catholic Church, all at 8 p.m. Tickets are $20-$50. Call 788-1212 or visit www.richmondsymphony.com.